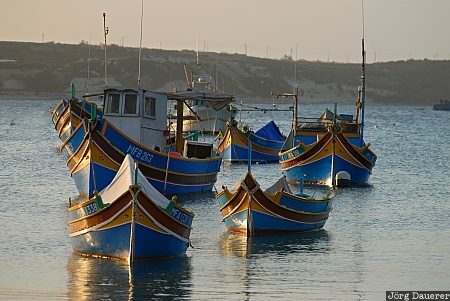 Luzzus the typical colorful fishing boats of Malta in Marsaxlokk Harbour illuminated by warm morning light. Marsaxlokk is on the east coast of the Mediterranean island Malta. This photo was taken in the morning of a sunny day in March of 2009. This photo is part of the exhibition Fishing Boats (October 2009). This photo was the image of the month in July of 2011. This photo was taken with a digital camera.